Although gradual muscle mass loss is a natural part of aging, most people achieve their peak muscle mass in the late 30s and early 40s. As a result, physically inactive people can lose 3 percent to 5 percent of muscle mass every decade after age 30. Muscle mass loss associated with sarcopenia commonly begins in the fourth decade of life, and accelerates after age 75. Sarcopenia is one of the biggest health threats to Americans today, and it affects about 45% of the U.S. population, while over half of seniors will have some degree of significant muscle mass loss. That being said, there are a lot of natural ways to build muscle fast, while preventing sarcopenia from being a problem. 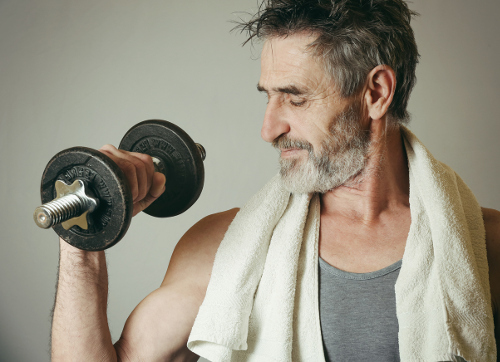 This article will detail the symptoms and cause of sarcopenia, and natural diet and treatment tips for approaching age-related muscle mass loss. What are the signs and symptoms of sarcopenia? As people age, they often become more sedentary, which results in the wasting of muscle fibers. The main sarcopenia symptoms are decreased strength and muscle mass. Other effects and symptoms of muscle mass loss include falls and fractures, problems with mobility, frailty, weak bones, loss of independence, disabilities, weight gain from reduced activity levels. There are also metabolic effects of sarcopenia that can reduce resting metabolic rate. This can increase the risk of type 2 diabetes, insulin resistance, and dyslipidemia—a sign of hypertension, and high cholesterol and/or triglycerides. Muscle mass loss with age will vary from 8 percent to about 50%, and men seem to lose muscle faster than women. Still, in general, women have less lean muscle mass, and are at a higher risk of sarcopenia than men. In both sexes, strength is also lost more rapidly than muscle mass. For reasons not yet understood, studies show that sarcopenia is more common in Caucasian men and women than their African-American and black counterparts. Inactivity and exercise are by far the top muscle mass loss causes. That being said, physically active people can also experience sarcopenia, and research shows that other factors can contribute to muscle mass loss. These factors include inadequate intake of calories or protein, a reduction of the body’s ability to synthesize protein, reduction in nerve cells necessary for movement and sending signals from the brain to the muscles, and a decrease in hormone concentrations. Other possible causes of sarcopenia include smoking, excessive alcohol intake, increased inflammation and oxidative stress, nutritional deficiencies, and various conditions like diabetes, heart failure, and cancer. While maintaining muscle mass and function are very important for independence, especially with the elderly, it may be possible to slow and even spare muscle mass loss with regular exercise and other natural treatment for sarcopenia. Let’s take a look at a handful of natural ways to easily build muscle mass. We all know the importance of exercise for muscle mass; yet, one in four adults are either never active or are just moderately active during their normal daily activities. A sedentary lifestyle is the worst thing for sarcopenia. On the other hand, research shows that resistance training exercise is a powerful way to improve muscle strength and reduce frailty in elderly adults. Exercise can also increase muscle protein synthesis, aerobic capacity, strength, and muscle mitochondrial enzyme activity. Exercising a minimum of days a week can definitely help slow muscle loss and prevent sarcopenia. Since inflammation can promote the breakdown of muscles, anti-inflammatory substances like turmeric can also have a positive impact on sarcopenia. Curcumin is the active ingredient in turmeric. A study published in the European Review for Medical and Pharmacology Sciences in 2016 found that adding a curcumin supplement called Meriva to a standardized diet and exercise plan would improve physical performance and strength in elderly patients after three months of treatment. As a result, turmeric has potential to prevent muscle mass loss. Omega-3 fatty acids will reduce muscle inflammation and influence mitochondrial physiology and muscle protein metabolism. The EPA and DHA in omega-3 fish oil has also been found to preserve muscle mass and reduce inflammation. A randomized controlled study published in the American Journal of Clinical Nutrition in 2011 found that omega-3 supplementation increases the rate of muscle protein synthesis in older adults. Another 2015 study published in the same journal found that fish oil supplementation would slow normal muscle mass decline in older adults. As a result, older adults can prevent sarcopenia and maintain physical independence with fish oil, or other omega-3 supplementation like flaxseed oil. Vitamin D deficiency is the most common nutritional deficiency among the elderly, while research shows that low vitamin D is associated with reduced muscle strength, increased body instability, disability, falls, and muscle mass loss and sarcopenia in older adults. A study published in the journal Clinical Endocrinology in 2010 found that vitamin D supplementation can help improve muscle mass and muscle function in older adults with low vitamin D levels. A combination of animal and plant-based protein sources can be effective in supplying amino acids to muscle tissue. Research shows that higher levels of dietary protein are needed for adults aged 65 and older. It also matters what type of protein you consume for preventing muscle loss because not all protein is created equal. The best protein-rich foods contain essential amino acids that the body cannot make on its’ own. Some of the most critical amino acids for your muscles include leucine, isoleucine, and valine. Studies also show that eating protein before and after exercise help promote muscle synthesis and increase muscle recovery. Some of the better protein foods include organic chicken, wild-caught fish, lentils, grass-fed beef, free-range eggs, kefir or yogurt, raw milk, natto, and raw cheese. For many people, sitting is life, whether it is working at a desk or driving home during a lengthy daily commute. It is this type of sedentary lifestyle and inactivity that can lead to sarcopenia. Other effects of sarcopenia include fractures and falls, weak bones, boss of independence, weight gain, and problems with mobility. However, sarcopenia can be prevented and treated with various methods, such as exercise, getting the right dietary protein sources, and taking supplements like vitamin D, omega-3 fish oil, or turmeric. Other natural therapies can also be helpful for increasing the nerve flow to muscles, including massage, acupuncture, and spinal manipulation. Balch, J., et al., Prescription for Natural Cures: A Self-Care Guide for Treating Health Problems with Natural Remedies Including Diet, Nutrition, Supplements, and Other Holistic Methods (Hoboken: John Wiley & Sons, Inc., 2004), 570-574. “Sarcopenia with Aging,” WebMD; http://www.webmd.com/healthy-aging/guide/sarcopenia-with-aging#1, last accessed April 24, 2017. “Slowing or reversing muscle loss,” Mayo Clinic; http://www.mayoclinic.org/medical-professionals/clinical-updates/physical-medicine-rehabilitation/slowing-or-reversing-muscle-loss?_ga=1.6363637.611419397.1455731336, last accessed April 24, 2017. “Sarcopenia: Treatment with Supplements,” Live in the Now; http://www.liveinthenow.com/article/sarcopenia-treatment-with-supplements, last accessed April 24, 2017. Franceschi, F., et al., “A novel phospholipid delivery system of curcumin (Meriva) preserves muscular mass in healthy aging subjects,” European Review for Medical and Pharmacological Sciences, 2016; 20(4): 762-766. https://www.ncbi.nlm.nih.gov/pubmed/26957282. Khor, S.C., et al., “Vitamin E in Sarcopenia: Current Evidences on Its Role in Prevention and Treatment,” Oxidative Medicine and Cellular Longevity, 2014(914853), 16, doi: 10.1155/2014/914853. Walston, J., “Sarcopenia in older adults,” Current Opinion in Rheumatology, June 23, 2014; 24(6): 623-627, doi: 10.1097/BOR.0b013e328358d59b. “What is Sarcopenia?” I Of Bone Health website; https://www.iofbonehealth.org/what-sarcopenia, last accessed April 24, 2017. Smith, G.I., et al., “Dietary omega-3 fatty acid supplementation increases the rate of muscle protein synthesis in older adults: a randomized controlled trial,” American Journal of Clinical Nutrition, February 2011; 93(2): 402-412, doi: 10.3945/ajcn.110.005611. Smith, G.I., et al., “Fish oil-derived omega-3 PUFA therapy increases muscle mass and function in healthy older adults,” American Journal of Clinical Nutrition, July 2015; 102(1): 115-122, doi: 10.3945/ajcn.114.105833. Scott, D., et al., “A prospective study of the associations between 25-hydroxy-vitamin D, sarcopenia progression and physical activity in older adults,” Clinical Endocrinology, Novemeber 2010; 73: 581-587, doi: 10.1111/j.1365.2010.03858.x.